I'm consolidating some uniform tips to make available (I'd like to include some photos when finished). Here are some of mine. Any suggestions? To acquire Air Force uniform items - coats, jackets, sweaters, belts, shoes, etc., you may use Army Air Force Exchange Services (AAFES) by way of base access to a Military Clothing Sales Store (MCSS), or by phone/fax directly from AAFES. For more information on CAP member access and eligibility, check the information here. Air Force service uniform trousers come in 2 materials - poly/wool blend and 100% polyester. 100% polyester is a good choice for people who are genuinely allergic to wool, but keep in mind that 100% polyester pants may NOT be worn with AF Shade 1620 (namely, the service coat) - it may only be worn with the light blue service uniform shirt. Air Force service uniform shirts come in 2 materials - the DLATS Air Force issue (inexpensive) shirt, made of polyester/cotton blend; and the "commercial" shirt, made of polyester/wool blend. The issue shirt is machine washable, and the heavier, higher quality commercial shirt is dry clean only. When purchasing in-store, you may have to ask for a commercial shirt, as they may be stored in the back. The Air Force-style blue cold weather cap (authorized in CAPM 39-1, section 6.2.6) is available from AAFES, Item # 6639252. Vanguard is CAP's official supplier for items not available through AAFES (insignia, etc.). Connect with Vanguard on Facebook and Twitter for regular discount codes (usually around 10% off your order). Use a mini-iron for difficult-to-iron corners, spaces between insignia, the edges of insignias, etc. A slim-line attachment works well for uniforms and insignia. Use a sleeve board or seam roll for ironing sleeves. If unavailable, you can use a CLEAN tightly-rolled towel to press the sleeves. Keep your ironing board cover clean. Stains can easily transfer to your uniform when ironing. For a better solution, purchase an ironing pad or blanket and keep it sealed in a plastic bag when not in use. The pad can also easily be packed for weekend activities, encampments, etc. These will also allow you to iron on a table or other surface, if necessary. To iron out difficult wrinkles or creases, place a metal ruler, hemming measuring tool, or aluminum foil under the area to be ironed. The radiated heat from the bottom will help remove the wrinkle or crease. USE CAUTION when removing; the metal will be very hot. A v-neck white undershirt is required when the Air Force blue shirt is worn open-collar. However, when worn closed-collar (with a tie), the v-neck will show through thin shirt material. To eliminate this, wear a white crew neck shirt with closed-collar combinations. Wear shirt garters to keep your shirt tucked tightly and your socks up. These are available in sets of 2 (Y-shaped; one worn on the outside of each leg) or 4 (2 worn in front, 2 worn in back). Carry a pocket-size stain remover for emergencies. Use a mesh cap block to keep your BDU/Blueberry Suit cap sharp. Choose behind-the-head style earmuffs to accommodate your uniform cap. To restore waterproofness of Gore-Tex, use a DWR treatment (available as a pump-spray or wash-in product). Wash with a DWR detergent such as Nikwax Tech Wash, then restore the water repellant with treatment such as Nikwax Tx Direct (wash-in or spray). You can check the condition of your Gore-Tex's water repellant using a spray bottle of water, or by running the garment under a sink faucet. If the water soaks in rather than beading off, the garment requires a fresh treatment. Gore-Tex patches are available for rips and tears. Cleaning gunked-up Velcro: Carefully comb through the hooks using a needle or pin, or scrub the hooks using a dry toothbrush. When machine-washing any item with Velcro, make sure both sides are joined. Not only will this prevent stuff from accumulating, it will protect face fabrics from scratching on the hooks. Do not use thin wire hangers. Use thicker coat-type hangers for uniform shirts to avoid unwanted creases and rust marks. Use shoe bags to protect your shoes while they are being stored, especially for transport. A divider adds extra protection by eliminating rubbing/scuffing. To keep your uniforms clean and protected, always keep uniforms in garment bags when not in use. For wool items, place cedar blocks in the garment bags to protect against moths. Don't forget your caps: Flight caps fit in the bottom of your garment bag and a service cap fits in a 2.5 gallon plastic storage bag. Plastic keeps your uniform protected from dust, dirt, mold spores or other things that might be around your home like pet hair, smoke, or moths. To restore the color and appearance of the soles and heals on your shoes or boots, use edge dressing (also sold as sole edge polish or color renew). This is a bottled liquid product. If you are unable to find edge dressing, you could use liquid instant-shine "polish" in the same way. Use a wet toothbrush to clean difficult-to-clean seams and crevices on boots and shoes. Use water-soluble fabric glue (NOT permanent fabric glue) to precisely attach cloth insignia to your uniform prior to sewing. Pins bunch the fabric; glue allows for a flat, precise attachment. Use a pen style fabric glue (link), rather than a glue stick, to get a more precise, clean application. After applying the glue and double-checking your placement measurements, gently place heavy objects (like books) on the insignia for about 3 hours, until it is dry (place the weights straight down; moving them side to side can shift your insignia placement). Once it is dry, you can sew the insignia and clean up any excess glue with a wet paper towel. Pre-shrink your cloth insignia before sewing them to your uniform. Place them in your uniform pocket or a lingerie bag to minimize fraying. Do a final pre-shrinking with an iron on a steam setting. Your insignia will likely bleed slightly. You can get the bulk of the excess dye out by washing the insignia in hot water (with hand-washing detergent such as Woolite, if you have it), in your sink, then blotting them dry with a paper towel. When preparing your ribbons, use a Ribbon Checker to figure out which ribbons you have, their proper order, and the proper attachments for those ribbons. Check CAPR 39-3 for details on award of medals and ribbons. When sliding on ribbons, gently bend the ribbon holder just enough to prevent the ribbon from pulling on the ribbons above and below it. This prevents excessive shifting of the ribbon fabric, which stretches and distorts the ribbon. If a ribbon becomes distorted or the back fabric begins to show, you can gently pull out the back metal rectangle, straighten the ribbon, and pop it back into place. Make sure your hands are clean when handling ribbons. If you use a commercially-sold fleece for the black CAP fleece jacket, regulations require that any logos be subdued or small. You can remove embroidered logos with a seam ripper (this is time-consuming, but produces a clean result), or spot-dye the logo black with fabric dye. Use industrial strength sew-on Velcro (available at fabric and craft stores) for leather jackets, fleeces, and flight suits. Self-adhesive Velcro gums up needles and thread, and can cause damage to a sewing machine. You can purchase this by the yard. Use Olive Drab Velcro (available from Vanguard, and elsewhere online) for AF-style flight suits and jackets. Use black for CAP distinctive flight uniforms, CAP black fleeces, and leather jackets. Velcro is NOT authorized for other uniforms (such as the BDU); insignia on those uniforms must be sewn on IAW CAPM 39-1. If you have earned a U.S. military badge that is authorized for wear on the Air Force-style uniform, you can have your badges custom-made in ultramarine blue and white to match your CAP insignia (this is optional). If not available through Vanguard, there are third-party vendors who offer these badges, such as Williams and Williams, Spur Name Tapes, and The BattleZone. Prior to attaching patches (particularly pocket patches), be sure to iron the area first, to avoid fabric bunching. Use a high setting with steam to encourage any fabric shrinking to take place BEFORE the patch is attached. As always with ironing, use a pressing cloth. When attaching sleeve braid to the service coat, pull the coat lining up and sew directly to the jacket fabric. Sewing through the liner can cause fabric bunching. Water-soluble fabric glue (highly recommended, even if you will not sew your own insignia. Pre-placing your insignia with fabric glue can reduce errors and expensive re-dos). Thread (for insignia, use Yale Blue - Coats & Clark color #4470, all-purpose thread). For AF-style flight suits, Olive Drab or clear thread for plastic insignia (note: clear thread is difficult to manage, as it curls easily, and it breaks easily). Heavy-duty thread is best for attaching Velcro. For service uniform alterations or sleeve braid, use navy blue (Coats & Clark color #4900). These are great tips. Some I knew, some I did not. Thank you for sharing. If you have any more, please share. I'd like to consolidate as many as possible. I wish that someone had told me about pressing cloths long ago. Shiny uniforms look awful. I'd also like to address any lousy practices. Wash your BDUs/BBDUs in cold water and avoid tumble drying. (This is slightly less of a factor now with fabric strip nametags than it was with the old webbed strips) This keeps your uniform "newer looking," reduces unnecessary shrinkage, and prepares it for ironing. Hang the uniform to dry before pressing. If you're *REALLY* crazy about starching your uniform, use StaFlo or similar starch in a spray bottle mixed down 2:1 water to starch, spray the uniform down after it comes out of the wash on the hangar while you let it hang-dry. Then press with steam. You'll like the results. Trim the insignia down using pinking shears to reduce fraying. Lightly dust the backside of the insignia with adhesive (use a box or mom will get mad!). Fold the insignia on parallel sides. Place under a book or something else heavy to hold it for a few minutes (ie. M-1 tank, a handy aircraft carrier, etc). Dust the back again with adhesive, fold the other two sides. Place back under convenient half-track or APC for a few minutes. Dust one last time, position & measure, then hold until relatively secure. Sew in place (WITH A SEWING MACHINE). When attaching devices on ribbons, break the back prongs off of the devices. They will break off clean. Then use white Elmers glue, put small dab on the back of the device with a toothpick. Then press the device onto the ribbon. Use a clean toothpick to easily wipe off any excess guy that me squeeze out. Any small amounts left dry clear. Your ribbons wont get all warped or distorted by punching the clasp through. Ive done this for years. Its sticks grey and your ribbons stay looking sharp. Elmers Wood Glue works the best, but its yellow. You just have to be more careful about what squeezes out. Get an old ribbon and practice it before you go to working on your real set. If you have fat fingers.... use a pair of tweezers or needle nose pliers to set the device on the ribbon. You don't want to slide it into place. UltraThin uses tweezers to place their attachments on the ribbons. It does take some practice, but many squadrons likely have some old, dirty ribbons that have little use beyond acting as a practice piece. A small pair of needle nosed pliers work well too and have a better gripping surface. ^^true. Just don't get the grungy pair out of daddy's tool box . Definitely. I have a pair that I keep in my uniform box with all of my other supplies like thread and extra frogs. James, as usual you've nailed it. Awesome list! Don't use any type of floor wax on your shoes/boots. Don't use edge dressing to shine your shoes/boots. Use a seam gauge when you do your measurements for insignia. Always wear thick boot socks when wearing boots. You only need at the most 4 shirt garters for your blues shirt. Depends on the sock, UA makes some mean boot socks which are thin and extremely comfortable. Also depends on the boot, get good boots and you won't ever worry about it. Edge dressing will work wonders on the edges of your shoes, just not any other part of them. Yeah no I wear and have worn nothing but high quality boots for 16 years both in CAP and my day job. Thick boot socks are a key factor in preventing many issues that can develop with your feet from wearing boots. The money is well spent on both items and go along way in preventing other issues down the road. Hrm. As a cadet I was just told to wear two pairs of socks. Your feet and back. I always wore boot socks even as a cadet and good boots. I would not recommend wearing 2 pairs of socks to anyone, especially if they're cotton. They are likely to separate and can rub, causing blisters and such. The only exception I'd make would be to say sock liners are fine because they're skin tight and thin. I plan to include footwear choice recommendations in my final printable version. I have taught members how to choose socks, boots, and shoes as part of uniform classes and GT gear classes. That includes considerations like material types for socks, construction of shoes/boots based on your individual needs (say, if you have foot/ankle/knee/back issues, or if you pronate/supinate), if you have dry skin or sweat a lot, etc. I wear SmartWool socks for boots, pretty much exclusively. I also have some Under Armour boot socks that I got from AAFES Clothing Sales. Bates Delta 8's with their adjustable support insole (mine are going strong after 4 years of regular CAP wear). Corcoran marauders - NOT the all leather variant, the cloth and leather one. (also decently comfortable but pricier). I would not recommend wearing 2 pairs of socks to anyone, especially if they're cotton. I would not recommend wearing cotton anything if you can avoid it. It is a horrible fabric. For tbe undershirt, wear polyester. For the socks, either merino wool or polyester. For those that do not know, cotton when wet is horrible at retaining heat. In addition, it takes a long time to dry. Polyester is better at retaining heat and is quicker to dry. In addition, it is typically lighter than cotton. Wool has fantastic heating abilities when wet. The down side is that it is heavy and can a while to dry. Merino wool is more breathable and does dry faster than regular wool. Backpackers are pretty much straight anti-cotton clothing. I had "Cotton Kills" on about 3 slides of my most recent presentation on selecting cold weather clothing. This is when goons from Cotton Incorporated showed up at my front door, attempted to smother me with a bag of cotton, and told me that I had to replace it with their "Cotton - the fabric of our lives" song. When blousing your trousers, blouse them from the inside. This keeps the trousers from riding up or becoming unbloused. 3. Lower the trousers, create an inside cuff and wrap the blousing band* around your cuff and boot. 4. Raise trousers, buckle belt. The trousers will be taut when pulled up. *Use the Velcro 1 inch blousing bands. Or you can place the issue GI bands into the cuff and crimp together. Instant blousing and last for awhile. I agree velcro bands work wonders for blousing. This trick is also quite helpful for those who are in the awful habit of wrapping their extra long boot laces around the tops of their boots. Instead, after lowering your trousers per these instructions, draw the laces as tight as you like and tie your first bow. Take the long ears and pull them up your leg. When you blouse the trousers with the band, also wrap them around the surplus boot lace. It will take a little getting used to, but looks so much more squared away. I use the 2 inch Velcro elastic bands and fold them in half. I'm pretty sure my Infantry Combat Boots came with instructions that said to wrap the laces around. But it would be faaaaaaaar from the first time I ignored an instruction booklet. There are many, many ways to blouse boots. Take ten people and you will find ten different ways to do it. And every one of them is the "right" way.... As long as the results meet the requirements of CAPM 39-1, who cares how you did it? AAFES is unloading their woodland color blousing bands for half the price of Vanguard. We should stock up. I've been doing a BUNCH of edits to the master list of tips above. Additions are welcome. I'd like to make a printable packet that can be shared. 39-1 should not exist in a vacuum. People who don't have a military or cadet background are easily overwhelmed and confused by 39-1. Having tutorial-type information provides context and fills the gaps. I'm leery of a "list of uniform tips" because "good ideas" and "short cuts that worked for me" slowly become "this is the only acceptable way of doing XYZ". Thanks for sharing! These are great. Have ran across this with cadets in my squadron, especially when it comes to utilizing cargo pockets and pockets on the bdu top. Somehow It went from "It looks better when they are empty" to "the regs prohibit you from using those pockets." One thing I always wear are my shirt stays. It's a habit from the Marines. Of course I have had my trousers and shirts tailored first, and then I still use the stays because it keeps the shirt pulled taught. Looks better than when it starts backing out of your belt line because you get up and down or bend over and stand back up. I think this is more the extra mile though than what I think most people would do. You know, I do it the way I was taught in the Marines. Has served me well so far. Wrap the laces around the top of your boot and then tie the bow. Place the blousing band between 2nd and 3rd eyelets. Don't pull your trousers all the way yet where they would normally sit on your waist. Blouse the trouser legs. Pull up trousers and button them. This gets you a tight blouse and one that is neat versus having a bunch of material hanging down and over the blousing point. Of course you're going to get some material hanging down as you work throughout the day. Won't that mean the pants are draped down on the top portion of the boot though? I like to look good in what I'm wearing as much as the next guy, but if we spent half the time we spend jawjacking about uniforms on our actual missions, we would be a force to be reckoned with. Our uniforms should look good. But if you're spending more time on your uniform than on the mission, you're doing it wrong. It works a treat for quickly and easily doing shoulder-sleeve insignia and collar insignia. Comes in really handy for ribbons and nametags... especially when they need to be spaced 1/4" above the pocket... Unlike CAP. WHY ARE YOU YELLING? ?? All CAPS is considered yelling on the Internet. And the Vanguard monthly discount is not worth yelling about. Phil..Sorry I upset you. I did not know that " all caps" meant anything. The computer just happened to be set with caps locked on. I did not even notice that until I cut and pasted the URL for the discount. With the high cost of Vanguard and their supply lock on many CAP items I was just trying to pass on a little discount. Some families have several CAP members and Vanguard items and shipping seam quite expensive compared to other sources. Unfortunately there are several uniform items we can only order from Vanguard. Merry Christmas. The mandatory non-wear date is next year, to have it off the uniform. Some units are not making new members put it on, but not making current members take it off until 2017. I'd ask your commander. ^^Good advise regarding to see how the local unit is handling this. On a personal note, the flag is no longer on my BDUs and hasn't been since the current uniform manual was released. And no...this is not an open invite to regurgitate that whole flag on/off debate. Problem: I've always had a hard time with shirt stays remaining connected on the shirttail. After recently joining CAP a few years removed from AD I encountered this again. My initial idea was to have buttonholes sewn into the shirttail so the shirt stay would have something good to hold onto. This may still work but I don't have the skill or equipment to do it and my local alterations doesn't either. Solution: what I can do, however, is sew on a button. I saw this on a cop forum and smacked my forehead that I hadn't thought of it before. I went to Walmart, got a pack of assorted buttons and needles for $1 each. Then I got some heavy duty upholstery thread for a similar amount. I picked 4 buttons that would fit through the metal part of the connector but would also securely hold it. This allows a shank to account for the spacing needed to hang the metal loop on the button. Time will tell how this works long term, but I dig it thus far. Try maybe going to locals Jo Anns or other local sewing/fabric store. "Hey I need two button holes on my shirt. I don't want to spend $200+ on a sewing machine. Can you help?" They may be able to do it for you...or suggest someone who does home tailoring/sewing/seam-stressing that can do it for you cheap. It would be lower profile but I wonder how much the pull of the shirt stay will cause the inside of a button hole to tear. I have like 4 other shirts that still have stripes on them that I'll take a swing at having buttonholed for later, so we shall see. I don't know....I've never had the problem of my shirt stays coming off. My first guess would be that you are pulling too tight. They are not there to really keep the shirts super tight. You might also want to try using more of them. Spread the load around. No clue. At one time I wore 6 total but as I've become less hooah with age I've mellowed to just 4. Yea, went from 8, to 6, to 4 now. Does the gut count as #5? I myself as a cadet, don't worry about shirt stays as normally when on Nellis for blues night meetings I'm in class a's with my service coat anyways. When at an event or when it's determined officers do not wear their coat at NCS Meetings, I wear a ShirtLock. I swear by the thing and it has made life so much easier. I don't wear shirt stays. I've seen far too many "incidents" with my male LVMPD Police Explorers when wearing shirt stays. lol. That gave me a good giggle, much appreciated sir, I'm going through personal issues so that was a well needed laugh. That 2005 story is ALWAYS a pleasure to read. I think I've seen it linked, and read it fully at least 4-5 times. Shirt garter emasculation... you only hafta experience it once. Once. It's probably not tarnished, the epoxy coating has probably yellowed, depends on the vintage. Best bet is to just get a new one. Yes, what was once white is now yellow. Don't have time to buy a new one as I need to be ready by Friday evening. Bought the original 8 years ago, if that helps. Even if I didn't need it so soon, I'd prefer to try to clean/restore it before buying a new one. You could try something like those kits they sell to clean up faded/fogged headlights... Beyond that replacing it is the only sure fix I know of. Fold the shirt/blouse backwards (along the "spine", to give a reference) and line each half of the collar up with the other. Then make sure that it's a mirror image. Did this to help someone fix their stuff in a hurry before a uniform inspection. Even if it's not quite the right distance from each edge it'll look a bit better. I finally came to the point where I had to refer to this post to find the thread # for the patches. I may have to change the colors. We'll see. Might just be #4900 (Navy). If it's #4900, that's available pretty much everywhere. Windex worked well for me, followed by a wipe with a cloth having a light spritz of Pledge. Light spritz, barely wetting the cloth. I'd like to resume working on this project of compiling uniform tips into a guide, now that I am getting caught up on a number of post-hospital projects. I'd like to have a printable version (that individual members can print, or you can distribute during classes) and a web version to which you can easily point your members. dose anyone know if your allowed to military press your AF blues uniform? Over all good article. If you mean "military creases" with 2 running down the front and 3 running down the back, then no. Unbutton, starch and iron the shoulder straps on blues shirts before ironing the rest of the garment. Subtle, but goes a long way. Here is my step by step pro-tip for getting your name tapes, patches and insignia properly sewn on for your ABU/BDU/BBDU. I find this method to produce cleanly folded, properly aligned and attached insignia and reduce headaches of trying to explain 39-1 requirements to mom's/wives/seamstresses and inevitably having to have things redone. -Cloth insignia, name tapes, patches as required. -Good, sharp scissors. Do not use your mom/wife's good scissors. If you gunk them up with adhesive they will be angry. -Sewing machine or seamstress/mom/wife etc if you don't sew. -Tailor's chalk or other delible marking implement. 1. Using a good pair of sharp scissors, trim down backing fabric on insignia to 3/8 of an inch around insignia edges. For name/CAP tapes, trim to 1/2 inch beyond width of pocket. 2. Trim double sided instant hem tape to size with 1/8 inch around insignia edges. For tapes, cut hem tape to width of pocket. 3. Apply instant hem tape to rear of insignia. Leave paper backing on hem tape for now. Patches get hem tape applied along each edge and trimmed to just under the edge of the patch as necessary. 4. Fold over each edge of insignia, using the stiff edge of the hem tape with backing as your guide. Iron each fold to a sharp crease from the REAR side of insignia to prevent iron shine. For tapes, fold under ends at pocket width and crease accordingly. 5. CAREFULLY remove backing from hem tape. 6. Starting with the narrow ends of the insignia and following your established creases, fold over the 1/4 inch of excess fabric per side and press firmly to adhere to hem tape. 7. If necessary trim any stray threads or fabric poking outside your now properly spaced and folded insignia. 8. Apply another layer of hem tape to rear of insignia and nametapes. 9. Remove backing from hem tape on name tapes. Apply to proper position on pocket edge. Press firmly to adhere. 10. Measure placement of insignia over name tapes. Place insignia on uniform (Note: DO NOT REMOVE HEM TAPE BACKING ON INSIGNIA YET.). Mark position with tailor's chalk or other chosen marking implement. 11. Measure and mark collar insignia placement in accordance with step 10. 12. Remove backing from hem tape on all insignia. 13. Place insignia in proper locations as marked. Press firmly to adhere. Double check placement with ruler before continuing. At this point it is still fairly easy to remove and re-position insignia if needed. 14. Turn garment inside out. Iron over inside of garment where insignia is placed. This melts the adhesive and sets the insignia in place. Iron collar insignia from underside of collar. 15. Sew insignia/tapes/patches in place using sewing machine with appropriate thread color or bring to seamstress. It is interesting to me that the items that aren't mentioned look wrong. 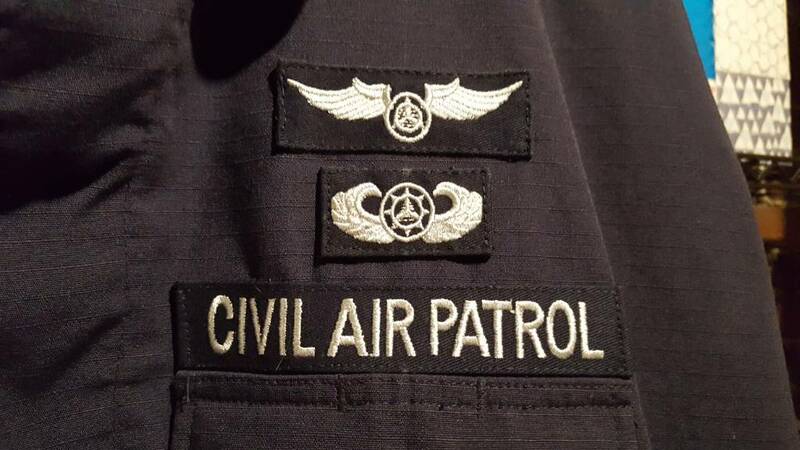 The rank isn't centered and the wing patch (which in Nevada we don't have to wear on any uniform) looks like it is an inch down from the seam rather than 1/2 inch. I just sewed these for someone and the IC badge is exactly 1/2" from the top of the name tape to the white, and the IC badge to wings is exactly 1/2" white to white. As you can see, it looks... "off". My solution usually is to cheat the middle badge down a tiny bit (within the "tolerance", like less than 1/16") and the upper badge up a similar amount. The evened out spacing looks more correct. Nobody has even questioned it in the 15 years I've been doing it that way. I am getting a device for my Encampment Ribbon, so I am curious why you would glue the device on. What if you earn another device? It never sits right when you use the prongs. It's easier to put a dab of glue on and the position the device on the ribbon and make minor corrections before it sets. If you punch the prongs through and then realize they weren't attached to the device straight, when you pull it out there's massive holes in the ribbon that are quite noticeable. It's also easier to move the ribbon from one rack to another if the devices are glued. If the prongs catch on the rack while you're sliding it off you're probably going to lose the ribbon. And ribbons are cheap. Don't worry about ruining one. If you are using white school glue then you can probably remove the device to reposition when you earn another device. Plus, like PHall said, ribbons are cheap. If I have to order them from Vanguard, I'll make a ribbon last as long as possible. My military ribbons are easy, I can just go to MCS and grab them. That's part of the reason I only use plastic racks instead of metal. I've had the metal ones slice a ribbon right off the backing just by sliding it on. It's all a matter of technique. I've wrecked exactly two ribbons on metal racks, and it was the same one - the purple and white POS that I've always had trouble with. I think these were all great tips! Thank you for sharing them! I have a question though, how often would you recommend you iron your blues and ABUs? Blues coats and trousers should be sent to the dry cleaners after wearing three or four times, or when they are visibly dirty. They need to be hung up between wearing to reduce wrinkling. They shouldn't really be ironed after they have been worn. That just embeds any dirt. I launder my shirts after each wearing, but you might get away with two or three wearings if you are really careful. I have more than one, so I'm not wearing the same shirt all the time. Utility uniforms - wash them and hang them up immediately out of the dryer. That means they are on the hanger when they go from the wash room to the closet. No wrinkles. ABUs are pretty good and being wrinkle resistant. Unless you are overloading your dryer then they should come out with no wrinkles. Blues should really only be dry cleaned. You can iron them if needed but never directly. Use something like a handkerchief between the iron and the blues. Also, the service coat is a formal dress item and not an every day wear item. It is worn for ceremonies or things like recruiting events. If you only wear it when it is appropriate then it will last a long time between cleanings. All you have to do is shake out the wrinkles and wear, that's what I used to do. I dry clean my blues pants, tie, and cap once or twice a year, I use Dryel the rest of the time, and launder the blue shirt. Put a cardboard flatblock inside of your PC to keep the top of it nice and firm, much like a ridgeway cap. I recommend thin cardboard when not wearing it and double-wide when you are. Do this cut and dry for a solid few weeks, and the top of your cover will stay shaped better than before. And, if it's within regs, get an 8-point cover. Just my two cents. Where are you seeing 8-point covers in CAP? Please provide guidance where in CAPM 39-1 where it is authorized/required to put cardboard in one's hat. He isn't. The USMC style covers are not authorized. At all. I've put a stop to them in 3 different units under my command over the years. BTW, Cadet: "Ridgway" is a proper name (GEN Matt Ridgway), and is both capitalized and spelled thus with no "e". I assume that you're referring to the cardboard and starched mods to the M-1951 field cap, or fatigue hat, formally known as the "Cap, Field, Cotton, Wind Resistant, Poplin, M-1951", which came in while he commanded 8th Army (the ones with the Umbrella Corporation patch). By 1953, with not much fighting or actual ops to do in Korea, the REMFs had taken over. And, if it's within regs, get an 8-point cover. Just my two cents. The Air Force doesn't even wear an 8-point. If you aren't sure if it's even within regs, why suggest it to someone else? go get into the field, and you'll sweat your pretty cardboard into pulp! I cannot stand anyone putting cardboard in their PC...nor anyone that Rangers their cover up. Wash it. Starch it. Shove it into your pocket. Pull it out. Push out the folds. Slap it onto your head. Repeat. If you need to put a device into your cap so it keeps its shape, or else it otherwise is as flimsy as a cotton t-shirt, you bought a garbage cap. Back in the dark ages when the Marines still wore BDUs, there was a statement in the 39-1 that specifically prohibited the "Marine style BDU cap" (8-point). It no longer appears in the 39-1. Get one of these and you're done. never come out, you can put in in your pocket where it belongs and springs back to life when it comes out. that as the preference for CAP.